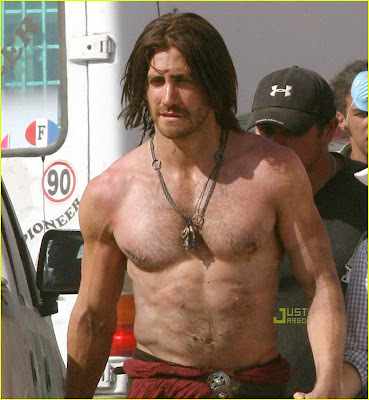 JustJared gives us our first look at the quite buff Jake Gyllenhaal as Dastan from the popular video game Prince of Persia: Sands of Time. The movie is shooting now in Morocco, North Africa and is set with a release in May 2010. The film follow the games premise which follows an adventurous prince who teams up with a rival princess to stop an angry ruler from unleashing a sandstorm that could destroy the world. Gyllehaal who has spent alot of his time prior to coupling up with Reece Witherspoon, with Lance Armstrong and Matthew McConaughey, looks like all those long bike rides paid off! Jake is in primo shape and with that long hair looks the part of Dastan (other than being white!). The pants color scheme is a tad off from what I remember from the videogame, but for the reality of shooting in the desert major action sequences, white pants just wouldn't work! Prince of Persia was recently pushed back from its earlier 2009 release date, but the film should shape up to be pretty fun. Mike Newell (Pushing Tin and Donnie Brasco) is directing the screenplay written by Carlo Bernard. More shots of Jake with Reece walking around the set. Thoughts on the first look at Jake as Dastan? 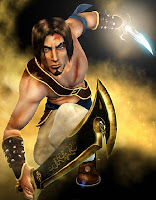 Are you interested in Prince of Persia? Should someone of the correct culture have been cast for the role?